Smartmobile market penetration is just accelerating ahead – this year 1.6Bn people will have smartmobile in their hands. Devices are spreading faster than language of the tech world - English. Soon the smartmobile market becomes a multicultural environment, yet a big piece of the ecosystem – smart mobile applications are still mostly in English. Most of the developer community understands English and do not have any experience to be in discomfort of not knowing the language. Just how do you feel about this: Ha megérted ezt a mondatot – jelentkezz nálam egy üveg jó Pilsner sörért. The chart tells a lot – almost 3 out of 4 potential users are locked out from fully understanding your app, if you have only English version. 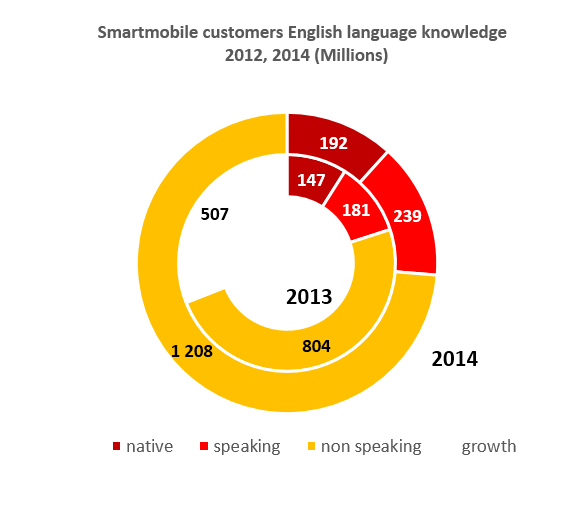 Moreover 4 out of 5 new smartphone users are not having English knowledge (404M non English growth v. 507M total growth). And – as we are progressing with cheaper devices into the 3rdbillion of smartphone users – this ratio will increase further. So, do we really get more downloads, users and revenue, if we localize our app? Localized apps are overperforming more than 10x other apps in monetization. In Russia, the 7% localized apps deliver the 70% of the total revenue, while the 93% non-localized apps bring only 30%. 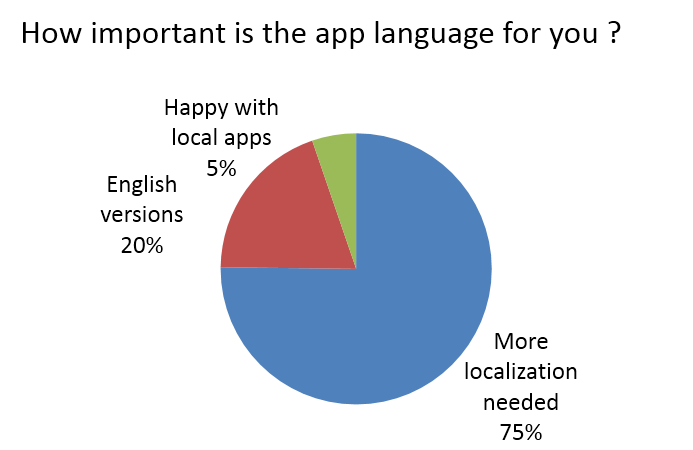 20% of users are happy with English versions – this is roughly inline with English knowledge. 5% of users are happy with the current portfolio of local apps. But the majority 75% would require more localized app. So, how can we leverage this customer demand? As a developer, how do you know which market would demand your app, if it were localized? Which Language Service Provider to turn to have the best deal? And how to conduct an uncomfortable and boring localization project?